Supported by Creative Victoria and by the City of Melbourne through their Triennial Grants Program. Liam Benson + Adorned, Karen Casey, Jody Haines, Teresa Hsieh, Mitch Mahoney + Molly Mahoney, and Justine Youssef. All of us presents a contemporary framework by which to explore the importance of collaboration and the connections between artists, their practice, and the audiences they reach. Featuring a collection of multidisciplinary works by Adorned + Liam Benson, Karen Casey, Jody Haines, Teresa Hsieh, Mitch Mahoney + Molly Mahoney, and Justine Youssef, the exhibition acts as a collective response to our need to connect more deeply and meaningfully – providing an exploratory space to reflect on what it means to be a greater we. Drawing on an interrelated philosophy of love and respect that transcends cultural boundaries and speaks to a way of being where everything and everyone is equal and interconnected, the exhibition emphasises the principle of human connection as something that is needed, but also an action, dialogue and mutual exchange in contemporary practice that is driven by both trust and respect. In a world seemingly felt through the digitalisation of relationships, and experienced through the overwhelming access to data, All of us is a timely reminder of the importance to connect; with people, with a vast range or perceptions, with place, ideas and knowledges. The importance of being able to take part and connect with people, places, and ideas, to know and to feel is reflected in the wide-ranging approaches the selected artists engage; prioritising the sentiment of reciprocity and responsibility that resonates within the exhibition space as a model of and for art-making. The selected artists open-up practice to community, collective-making and participation by taking as their theoretical and practical departure point, human relations and their social context, rather than an independent and private space – making explicit the current need to connect to the local, and connect socially, in a world filled with uncertainty and in constant flux. In this context, and in acknowledgement of the land that binds all of us, the exhibition celebrates the creative rewards of collective activity as a cultural strategy to encourage new connections, reveal those that might otherwise remain latent – providing a unique exploration of what it means to be human, while revealing the elemental vibrations that connect everything and everyone, All of us. Imagine a delicate thread as strong as spider’s silk woven through the works in All of us. A multitude of personal narratives bound together to signify the affinity between artists, their collaborative modes of creative practice and the emphasis they place on compassionate engagement with audiences. As curator Jessica Clark puts it, the exhibition provides “an exploratory space to reflect on what it means to be a greater we”. BLINDSIDE, as an artist run initiative that is now ten years deep, provides the kind of safe and supportive environment that enables these artists to fully realise work led by an ethos of collective-making. All of us, while acknowledging that the neoliberalist agenda coerces all humans to adhere to a strict individualism, also acts as an antidote to that suffocating pressure. There is a sense of the works sustaining each other, forming a vital ecology within a broader framework of contemporary and experimental practice. Teresa Hsieh’s inflatable sculptures reveal the internal mechanisms of the body: the lungs inflating, an expansion of the chest as it fills with air (that life-giving element we do not often pause to consciously consider). Hsieh has given form to these ontological membranes, externalised but still requiring a support system – nothing exists in a vacuum. The viewer is reminded of their own physicality, and vulnerability in the moment of letting the body go: what are the implications of not having a trusted person to catch your fall? Is it enough to rely on yourself, to push through the anxiety, panic and nervousness without the reassurance of another stabilising presence? The artist opens us up to an existential experience, resisting attempts to define and confine the art object; just allowing it to be, and to occupy space. Trust for One is defined by three essential components: making/process, transparency and family attributes (to give and to care). Above all, Hsieh wishes for the viewer to be enlightened by what they witness, and to tap into their childlike curiosity as they interact with the work. Karen Casey’s handshake project is a manifestation of “the affective labour of human contact and interaction”, inspired by the University of Adelaide’s commission for a public monument marking Aboriginal reconciliation. In an event hosted by the university in 2006, Indigenous and non-Indigenous people were seated facing each other and asked to clasp hands as they exchanged personal anecdotes. What made this process particularly unique was the wet plaster being moulded in the space between their hands, forming shell-like objects as a record of each encounter. These hand-shells subsequently shaped the public monument. The casting process took 20 minutes from start to finish; Casey was struck by the capacity for people to transcend a potentially awkward scenario with a complete stranger to develop meaningful connections across cultural boundaries. Let’s Shake – Handshakes for Reconciliation was repeated numerous times in Melbourne as a series of public performance events and there have been several hundred hand-shells cast and exhibited in various locations. These objects are imbued with the energy from each person’s hand, taking on a sacredness as tangible outcomes of an extended gesture. 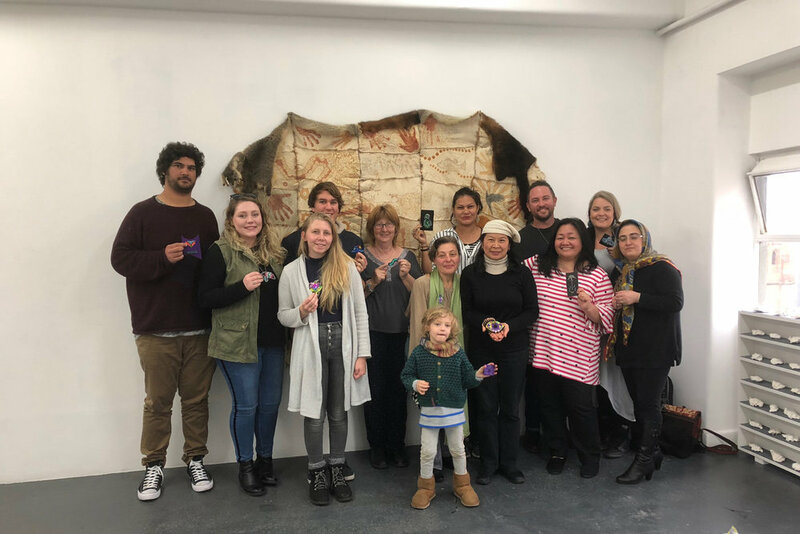 In a similar manner, Mutti Mutti and Boon Wurrung artist Maree Clarke has foregrounded collaboration and collective-making with members of her family – Mitch and Molly Mahoney, her niece and nephew. The artist transfers her cultural knowledge to her young family members, reasserting the intergenerational bond that exists between them. Emu feather tutu overlay symbolises Molly’s experience of two diverse worlds: life at home with her family, immersed in art and culture; and her tenth year at school, where she performs ballet. Dance is the intermediary between these worlds, and Molly has created her first work to reflect both her Aboriginality and love for ballet, as well as her life journey to age 16. Possum skin cloak is Mitch’s interpretation of traditional stories relating to different creatures along the Murray River, each representing an important character. Bunjil the Eagle is a powerful being in Mitch’s life; Mum is the owl, watching over her son; Dad is the wise crow, and Molly is the turtle. Handprints of family members are placed around the perimeter of the cloak, epitomising the love and kinship poured into this work. Jody Haines celebrates the achievements of Aboriginal and Torres Strait Islander sisters and Elders from south-east Queensland who have made a vast impact on their communities in Women Dreaming, seen here as documentation of the original projection work. Collectively, the smaller images that formed the projection sequence depict these women sitting for Haines, their portraits repeated on a vibrant gradient background. Each has been chosen for their leadership and commitment by other outstanding Aboriginal women: Dr. Jackie Huggins, Dr. Sandra Phillips and Dr. Chelsea Bond. Women Dreaming came out of a weekend spent “yarning, listening and learning” and is based in relational portraiture, where the process and conversation during the making is equally important to the work’s final outcome. In the words of Haines, these images “acknowledge our sisters’ strength and womanhood, their community and knowledge, their spirit and songline”. The identities of these women are inextricably linked with the community-based work they perform, having chosen to devote their lives to the people around them. Art-making as a social practice generates wellbeing and communality among participants. Adorned is a group of culturally and linguistically diverse artists and craftspeople based at Western Sydney’s Parramatta Artists Studios. Since 2014, they have collaborated on a wide range of projects facilitated by artists Liam Benson and Kiri Morcombe. Adorned operates on an “open door” policy, providing a friendly, safe and accessible creative hub to the wider community. 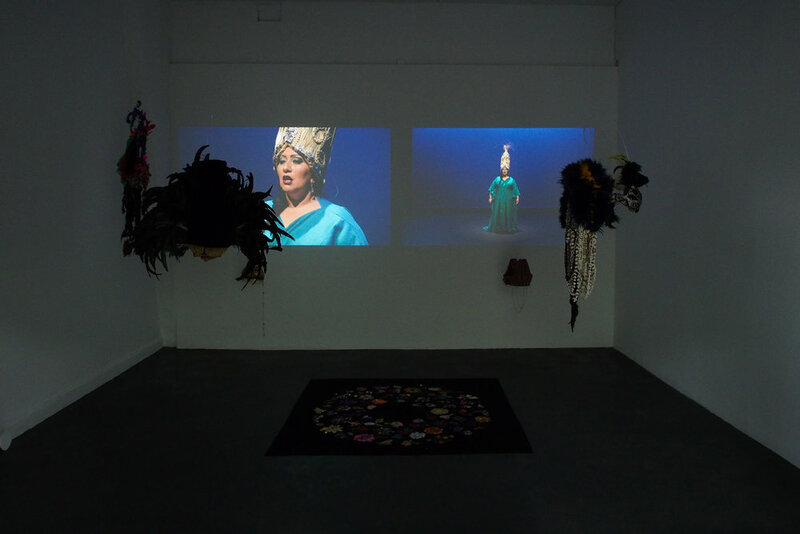 The second gallery at BLINDSIDE will house the video work Adorned – Wisdom, Memory and Song, an arresting collaborative performance featuring handmade wearables that are also displayed, for the first time, in an exhibition setting. Through movement, song and dreamlike narrative, the Adorned women explore life events that have shaped their identities. One artist recounts her persistent attempts to ruse her grandmother into playing cards as a young girl, just so she could figure out what this crafty elder was making – a salusalu, or Fijian floral necklace. Another artist dances with Benson and Morcombe, her internal monologue playing out as a series of fragmented musings, arriving at a resolution: “Embrace what I’ve become, and where I am”. Justine Youssef’s performance-based work an other’s Wurud interrogates the role that settler communities play in replicating colonial power structures by filling the gallery with the intensely sweet smell of Burnet rose, a species introduced to Darug land in 1821 in order to subjugate native plant life. Youssef’s recipe for rose water was taught to her on Darug land by the women in her family, substituting the traditional method of steam distilling the Damask rose for a “hybridised act of sorts”: simmering the Burnet rose. This speaks to the ingenuity of migrant cultures in maintaining cultural practices with whatever is readily available to them in diasporic contexts. Youssef wishes to highlight that just as Darug land was desecrated by an imperial flower in the 19th century, so the scent of Burnet rose will occupy BLINDSIDE and remind those present that the legacies of colonisation are ongoing. an other’s Wurud explores the medicinal properties of rose water and the potential to transform the gallery into a space for healing and reflection. Helena Reckitt, “Support Acts: Curating, Caring and Social Reproduction”, Journal of Curatorial Studies 5, no.1(2016): 6-30. Jody Haines, email message to Chloé Hazelwood, August 22, 2018. Justine Youssef, email message to Chloé Hazelwood, August 31, 2018. Jessica Clark is a curator, teacher and arts manager currently living and working in Melbourne. Her curatorial practice is driven by an intrinsic passion for art, sharing knowledge, working closely with artists, and bringing people and ideas together. Recent curatorial projects have focused on promoting new dialogues, challenging preconceived ideas/ideals, and exploring the transformative and performative nature of art and curatorial practice. Jessica is alumni of UNSW College of Fine Art, Australian Catholic University and RMIT University having completed a Bachelor in Art Theory, postgraduate studies in Education, and a Master of Arts Management respectively. Adorned is a community group of artists and craftspeople from culturally and linguistically diverse backgrounds who share a love of making. Based at Western Sydney’s Parramatta Artist Studios, the Adorned community have co-run an ongoing program that supports participants of all ages from culturally diverse backgrounds by providing a friendly, safe and accessible creative space. Together with the support of Parramatta Artist Studios and facilitators Liam Benson and Kiri Morcombe, the group offers a creative skill sharing space where participants can engage in developing new solo and collaborative work. The Adorned artists have collaborated between 2014 and 2018 to make sculpture, photographic portrait series, wearable art and a multimedia performance installation. As well as developing and exhibiting artwork, the Adorned artists utilise each exhibition as a way of engaging community thorough public programs and creative workshops. Adorned includes artists; Gail Barclay, Tamkin Hakim, Farzana Hekmat, Seinileva Huakau, Haifa Kazemi, Hilin Kazemi, Kiri Morcombe, Angela Paikea, Bibi Sherin Rahmati, Tacheen Stuart, Marina Robins, Maureen Unasa, Susan Ling Young and Kathryn Yuen. Liam Benson is a multi-disciplinary artist whose practice incorporates performance, photography, video and textiles. Benson’s work discusses gender, identity and culture by subverting and cross referencing entrenched ideologies, popular iconography, art and media language. Liam’s practice is informed by working collaboratively with diverse communities through an ongoing conversation about how culture, sub-culture and identity interrelate and evolve. Liam Benson has been exhibiting and performing nationally and internationally since 2003 and is represented by Artereal Gallery in Sydney. His works are held in significant public and private collections including The MCA Australia, the Art Gallery of South Australia, Artbank and Western Sydney University. Karen Casey is an interdisciplinary artist who employs a combination of traditional and new media techniques, exploring intersections between the arts, science and society. She has a broad and diverse creative practice spanning printmaking, digital media and public art. Known for her signature light works and earth-encrusted surfaces Casey’s art resonates with a vibrant intensity that elicits intimate engagement. Drawing on her own indigenous perspective of connection to land, which she unites with a practical and philosophical understanding of the interrelationships between various cultural and spiritual beliefs, along with contemporary western science, her works have taken numerous forms. Casey's thematic interests have focused steadily on the interplay between mind and matter, the tangible and the intangible; referencing both ancient and contemporary modes of thought as she questions and challenges perceived notions of reality, time and space and our collective world view. Through this work, she aims to cultivate an affirmative ethos and ignite in her audience an awareness of the potential and transformative power of art and the creative mind. Jody Haines (Palawa) is a photo media artist (stills, projection, video) based in Melbourne. Her work focuses on Identity, representation and the female Gaze, exploring ways visual language can be applied through video and photography to deconstruct/breakdown ideas of gender and the representation of Women. The work places women front and centre of the frame and creates an opportunity for Women to be seen, not as an object but as an individual; strong, beautiful and complex. Jody has exhibited widely including Gertrude Street Projection Festival 2017, Ballarat International Foto Biennale 2017 and Sydney Festival 2018 as part of Tell: Contemporary Indigenous Photography, Immerse 2017 and Women of the Commonwealth Festival 2018. Most recently Jody was commissioned to create a projection work for Festival 2018 and Women of the Commonwealth 2018, Commonwealth Games Gold Coast. Haines has successfully completed a Masters of Art Art in Public Space at RMIT and lives and works on the lands of the Wurundjeri and Boon Wurrung peoples. Chloé Hazelwood is an emerging curator and arts writer living in Naarm (Melbourne). She is currently undertaking the Master of Arts Management at RMIT and her research interests include feminist art, queer art, Aboriginal and Torres Strait Islander art, cultural policy and curatorial activism. Teresa Hsieh is a Melbourne-based artist with a practice encompassing sculpture and installation to investigate the connections between the internal and external relationship with the body. She conceives air in space as an art object: highlighting the importance and value of this existential element. Hsieh’s self-made inflatables heighten visitor’s senses into witnessing the unacknowledged in a way to challenge our compulsion to construct meaning – allowing visitors to witness their modes of being in a way to challenge our compulsion to construct meaning when faced with her self-made inflatables. Hsieh holds a Bachelor of Fine Arts (in Sculpture and Spatial Practice) with Honours. She was awarded the Stoner Award for her graduate exhibition and was the recipient of the 2018 Mailbox Art Space artist prize from 2017 Proud Exhibition from the Victorian College of the Arts. Mitch Mahoney and Molly Mahoney descend from the Boon Warrung and Barkindji people. Their Mother is a Boon Warrung woman from the Kulin nation and their father is a Barkindji man from Darling River country. Both were born in North West Victoria and grew up along the Murray River, their art reflects upon their journeys in life, and the natural connection they feel inside to all that their country supports, creates, provides, and the ever-changing influence it has on them. They are young Aboriginal artists with great pride and passion in continuing cultural practices, their people, land and our future. Justine Youssef works across multiple disciplines through her practice, including video, installation, text and performance. Her practice is site-responsive and attentive to her respective origins in South-West Asia. The work is rooted in research into moments and places which allow her to move through questions surrounding post-colonial rhetoric, feminist lenses, and diasporic and material exchanges. Youssef is currently living on the unceded territory of the Darug and Cadigal peoples. In 2017, she received her Honours of Fine Arts from the National Art School. She has held a collaborative solo exhibition at Seventh Gallery with Duha Ali, for which they were awarded the New South Wales Artists’ Grant (Create NSW), and has participated in group exhibitions at Firstdraft, Woolloomooloo; Airspace Projects, Marrickville; MCA ARTBAR, Sydney; Bankstown Art Center, Bankstown; and her work has also been featured in Antidote’s Moving Nations 2017, Collab Gallery, Chippendale. Forthcoming exhibitions include a solo contemporary exhibition at 4A Centre for Contemporary Asian Art, Haymarket; as well as group exhibitions at Sullivan+Strumpf, Zetland and Casula Powerhouse, Casula. Her recent work has been developed through studio residencies at Blacktown Arts, Blacktown; and the Parramatta Artist Studios, Parramatta. IMAGES | Adorned, Participator community embroidery, Thoughts and Prayers - Facilitated by Liam Benson, 2015 – ongoing, glass seed and bugle beads, sequins, cotton, tulle, 135 x 135cm. Courtesy the artists and Artereal Gallery, Sydney. Photograph Liam Benson | Adorned, Wisdom, Memory and Song, 2017 - multimodal installation, dimensions variable. Photography, camera and sound recording by Craig Bender and Vera Hong, musical score by George Tillianakis (detail: Video stills - left to right Tacheen Stuart, Hilin Kazemi, Susan Ling Young and Kathryn Yuen) | Jody Haines, Women Dreaming (detail), 2018, photograph, 90 x 140cm. Courtesy the artist | Teresa Hsieh, Trust for One Series (detail), 2017, air movers, resin, polyurethane plastic | Courtesy the artist.